You'll be £13.00 closer to your next £10.00 credit when you purchase Coming Down in the Drink. What's this? 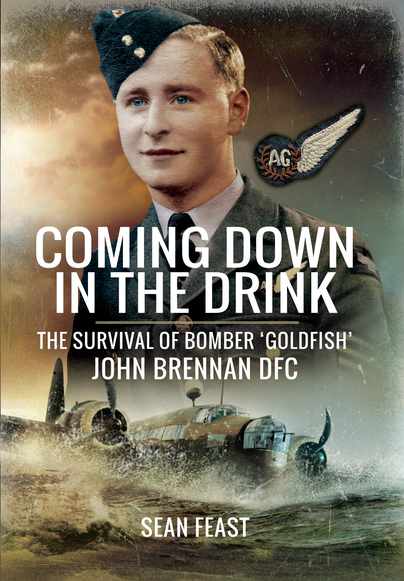 Coming Down in the Drink is the story of Flight Lieutenant John Brennan DFC. John is an Irishman who need not have fought in the war at all. A sense of adventure took him to London where he trained as a chef before joining the RAF and qualifying as a wireless operator/air gunner. Posted to 148 Squadron in the Middle East in 1941, John was soon in the fray as the front gunner of a Wellington, flying daily sorties to Benghazi in what was known as the mail run, bombing enemy ships that were offloading vital supplies to Rommel and the Afrika Korps. As much at risk from faulty engines as enemy action, John completed a tour of almost 300 hours of operational flying, including an operation in March 1942 in which his Wellington suffered an engine failure and came down in the sea. He thus became a member of the Goldfish Club. Posted home and commissioned, he spent time instructing in Scotland, surviving yet another accident in which his pilot crashed into a mountainside. Volunteering for a second tour, John joined 78 Squadron in the summer of 1944, being crewed with one of the flight commanders. He completed his tour, this time as a wireless operator, in March 1945, by which time they were operating in daylight in support of the Allied advance. He was awarded the DFC. John is one of the only surviving wartime members of the Goldfish Club, and has a fascinating record of 63 operations that covers both the forgotten bombing war in the Middle East in 1941/42, operating from strips of sand in the barren desert, to a main force heavy bomber squadron in the snow of Yorkshire at the end of the war. With the number of WWII veterans rapidly shrinking, this is another very welcome account based on the experiences of one who was there. The author has provided an absorbing story from interviews with John Brennan DFC. Highly Recommended. Sean Feast is the author/co-author of 15 titles for Grub Street, Fighting High and Woodfield, and has an established pedigree and audience. He has a particular specialism in Bomber Command with books such as Master Bombers, Heroic Endeavour, and A Pathfinder's War. He was one of the main authors to contribute to the official book released in conjunction with the unveiling of the Bomber Command memorial. He is also a regular contributor to various aviation magazines, primarily FlyPast and Aeroplane Monthly, and a volunteer for the International Bomber Command Centre. Professionally, he is a journalist by training, and runs an international PR and Advertising agency with key clients in military and defence.